Fluidly combining a mix of art and science, Martin Waugh has created a brand of high-speed photography, capturing an amazing array of stop-action fluids in motion. 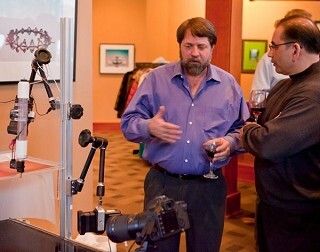 Waugh was on hand to demonstrate his art at Black Butte Ranch last Thursday evening. Using a combination of off-the-shelf tripods, clamps, and strobes, Waugh also concocted a device that times everything so that the water drops, the strobe flashes and the shutter actuates in a sequence that captures the exact moment that creates the work. "I grew up with four brothers and we had a motto that anything anybody could build, we could take apart, and through that I kind of figured out how to build the things I needed to do this that I couldn't get off the shelf," Waugh said. Waugh's use of high-speed photography makes it possible to capture curves and silky smoothness that reveal much about water that most of us have never seen. By varying the location of the camera, adjusting shutter speed, the speed of his flash, and at the same time varying the size, speed and position of the water drops, Waugh also varies the color of the water, it's viscosity and tension to create art that has to be seen to be appreciated. "I don't use any special cameras or lenses, really. I currently use a Canon 5D MarkII and a 180mm macro lens," Waugh said. "I use fairly typical high-speed photography techniques. I leave the shutter open for a relatively long time and use flash to illuminate the splash. The flash needs to be of a fairly short duration (50 microseconds) to stop the motion." The history of high-speed photography can be traced back to the mid-1850s, when William Talbot made what was the first stop-action shot using a spark to stop the motion. In the 1890s, English physics professor A.M. Worthington carried out a systematic study of splashes. Worthington initially used sketches to record his observations, as photographic plates at the time were not sensitive enough to respond to the brief exposures. Later, like Talbot, Worthington was able to use powerful sparks to create the required brief exposure times, and in 1908 published a book entitled, "A Study of Splashes." "The photographic challenges in my work were mostly solved by those pioneers, and by the advent of the computer," said Waugh. "Now my main effort is orchestrating the lights and liquids to create the colors and shapes." Born and raised in Boulder, Colorado, Waugh moved to Portland to attend college at Lewis and Clark, and ended up staying. "I came to Portland to go to college, and never left. I fell in love with the lush green. With its ferns, moss, and deep forests, it seemed like Eden. My plan was to be a math teacher. But, physics stole my heart, so I ended up with a secondary teaching certificate and a physics degree." An avid whitewater kayaker, Waugh still lives in Portland with his wife and two sons. "I could paddle year-round," said Waugh. "What a wonderful, visceral way to learn about fluids." The artwork of Martin Waugh will be on display at The Gallery at Black Butte Ranch through April. For more information on the artwork and processes that create it, visit www.liquidsculpture.com.